I can’t remember the last time I actually went into my bank in person. Simply because there is no longer any need to. My salary is electronically transferred to my account, my bills are paid via online banking and automatic transfers, my account statements are available online as PDF files…..
Gone are the days of paper checks, going to the bank to deposit my salary, and getting paper statements in the mail. Gone are the days of chatting up the pretty girl behind the bank counter. Now I have a relationship with my Internet browser, as I log on and start crying as I view my rather low bank balance. Our infographic today is all about digitizing your finances in the age of the Internet. If you haven’t already, you should be registering for online banking and installing your bank’s app on your mobile phone. You should also be stopping all paper statements and having them sent to you electronically. This will actually save you money. When I stopped my paper statements, my monthly bank fees dropped considerably. Let us know in the comments how much you have embraced the concept of online banking. Do you do all your financial wizardry online or are you of the Old School that distrusts all technology when it comes to your money? Let us know below. Here in India banks encourage customers to use online banking because the cost to bank is much less. And now mobile banking is getting really popular too. Yes, banking operations are becoming ATM-centric. I read somewhere that ATMs are 90% cheaper to run than a small branch. i don't know about the veracity of that figure, but it seems plausible. Then there is online banking of course. many bank institutions charge you a fee to use online banking, which is at times more than what it is worth. small businesses have to pay per payment to do online banking even if it's to the same company. It had been on the news about this issue.. it's cheaper to just pay the stamp if you don't have that many bills to pay. and helps keep postal workers their jobs. I still get my bank statements by mail and i have decided to carry on with this. Couple of weeks bank, NatWest in UK upgraded their banking software and it created problems all over the country. money in the accounts disappeared for most people and the banks remained opened over the weekend as well as long hours for a week to sort all the customers. (There were two people who couldn't get out of the prison even after paying bail money just because this didn't show up in the court accounts and had to spend their time in the jail over the weekend). So, should i be trusting this online thing? Partially yes. Life is easier in transferring money or paying off bills. But if something goes wrong, the paper statements are the only way for me to prove how much money i was having just before their systems crashed. I wish to use online banking, but I'm still afraid of online fraud. Over and above the benefit of being able to do everything online, the savings are not insignificant. Almost every bill that came to me by land mail, had between a $5 & $10 monthly charge attached. No more silly charges as bills paid on line. That much?! The justification? Did they have magical fairies hand-press each sheet of paper? In the past ten years, I've been to my local debit branch ONCE because I lost my ATM card. I went to HSBC and Citibank once, to sign up. Ditto with BII. If they don't do online, I'm not interested. I am, however, extremely jealous of the Germans. Their online facilities are way ahead of anyone else. What online facilities has Germany way ahead of anyone else? I've got two british and two german online banking and can't see any difference; and in fact one german bank charges me 2.50€ a month for no transactions and around 0.25€ per transaction over that. Okay, I may be wrong but periodically I search for apps that give me full control of my accounts, and pretty much all of them are Germany only. Take iControl for example, or Outbank. Both of them extremely feature-rich, but pretty much Germany-only. German banks actively promote online banking. Checks are virtually extinct and everybody (and I mean everybody) does online electronic transfers for their bills. And these transfers arrive at their destination within 2-3 days at the very most. It's very fast. One thing I also like is that I can send money electronically to any EU country (with the exception of the UK) for a flat rate of 15 cents. And again, the money arrives within 2-3 days. Balances and bank correspondence can be sent to your personal bank mailbox in PDF format and you can download it all to your computer. 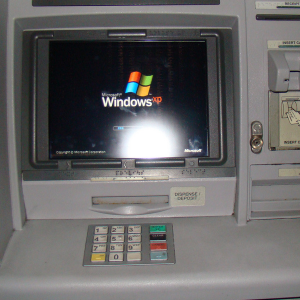 Look at that: the ATM is using Windows XP. Place your bets: how much until a BSOD? I would say my financial life is 80% digital. I still need to go to the bank and deposit cheques from clients and make electronic funds transfers that are over a certain bank imposed limit (for online transfers).